Polish artist, Zdzisław Beksiński, is well-known for his take on dark, surreal, dystopian imagery that would eventually, make his name well-known throughout the late 20th century. While I familiarized myself with Beksiński through my interest in dark and disturbing art when I was in high school, I never took the time to read up on him or educate myself about his life. The Beskińskis. A Sound and Picture Album is a great introduction. 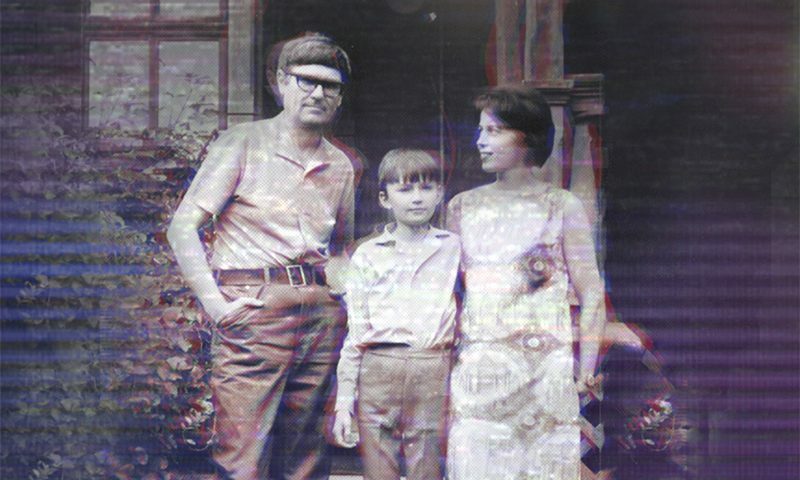 The Beskińskis. A Sound and Picture Album is an 80-minute documentary film that leads the viewer through the lives of Zdzisław, his wife, Zofia and his son, Tomasz Beksiński, starting in the late 1950s all the way through the turn of the millennium. This story is completely composed of the Beksińskis’ own home videos, audio clips and photographs, making it a deep and emotional viewing experience film—as I felt like I knew these people in a personal way by the time the credits rolled. The film begins at the turn of the millennium, with Zdzisław alone in his flat in Warsaw. He scans the apartment, lamenting the loss of Tomasz, foreshadowing the events that follow within the film and sets a grim undertone for what’s to come. Flash back to the late ’50s in Sonak, Poland, with Zdzisław and Zofia, two young lovers that have discovered that they’re expecting their first and only child, Tomasz. The film is constantly switching between Zdzisław’s life as a father and an artist—showing his artistic processes in between frames of him, Zofia and Tomasz. Each member of the family has their personalities on display for the audience, as these clips and bits of footage expose the family living their daily lives. The early years, as presented within these snippets, act as a time capsule not only for the family but for the eras themselves. This film ultimately showcases the dynamic of a family living in a post-war world and what life was like at the time through the lens of Zdzisław’s eyes. While Zdzisław Beksiński is the one I expected my focus would be on—as he’s a famous artist—the film focuses more on his son, Tomasz, and how their complex relationship would take many complicated twists and turns throughout his life. At the beginning, it appears that the Bekinski family were just an average, happy, carefree family. However, depression wrapped itself around not only Zdzisław, but Tomasz as well. Throughout the film, we see Tomasz’s frustrations with life and his struggles to see his purpose despite the fact that he paves his own way as a popular music journalist. As I approach the end of the film, it is evident that the only thing left in store for Zdzisław is tragedy. After the loss of his beloved Zofia in 1998, Tomasz would take his own life at the end of 1999. The film comes to its end with the death of Zdzisław himself when he was murdered in his Warsaw flat in 2005.